This week’s Hand Stamped Sentiments challenge is a technique challenge – Inked Embossing Folder Technique. I wasn’t sure if I would like it but I tried it and guess what? I LOVE IT! If you would like to learn how to do this technique SCS has a tutorial here. I used the Lacy Brocade embossing folder and inked it in Basic Gray. I love this new folder. It’s so vintage-looking. This card came together very fast. For the flower I punched 6 flowers with the Blossom punch then lightly sprayed with water. This is to make them easier to fold. I then stacked the layers then made a hole with my paper piercer then used a brad to keep the flower together. The butterflies are stamped with Papillion Potpourri then punched with the Elegant Butterfly punch. The sentiment is from the From my Heart stamp set. For that extra sparkle I added rhinestones. Super easy! 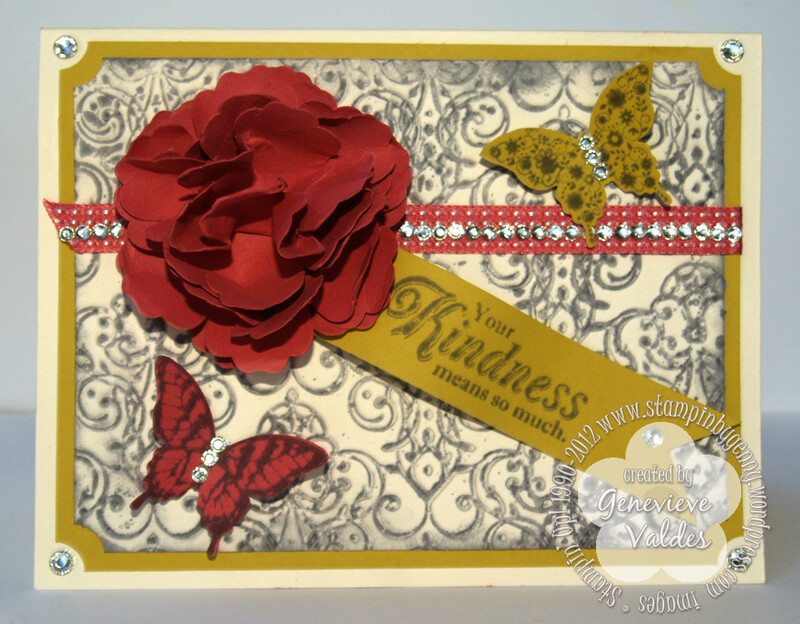 Be inspired and join us this week at Hand Stamped Sentiments! I look forward to seeing your projects. Gorgeous, as always. Love your color choices and the bling of course. Your flower is beautiful! I love it! Your card is tres elegante! The lacy brocade folder is perfect, and your flower and bling make it so fancy and feminine.